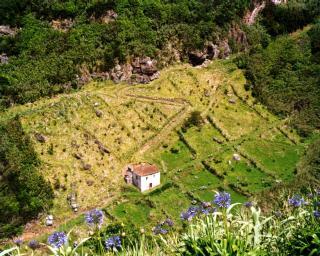 Two weeks on the Portuguese islands São Miguel, Flores and Faial. Distance traveled with rental cars: 1084 km (674 miles). 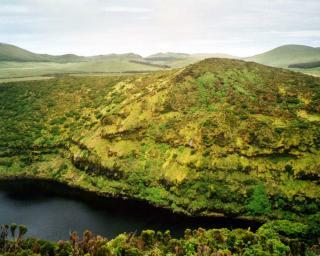 The 9 island of the Azores are predominantly mountainous due to their volcanic origin. There are many craters with lakes in the mountains. 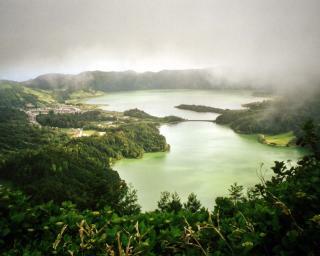 The crater of Sete Cidades has a perimeter of 12 km (7 miles) and accommodates four lakes and the village of the same name. 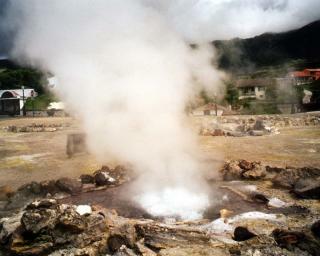 The small health resort of Furnas has many boiling water-holes and hot springs.  They are not only used by a thermal bath. The local specialty, a stew called Cozida, is cooked with the hot water in holes made in the ground. in white, blue and purple line the streets and must be trimmed regularly, so that they don't overgrow everything. In the mild and not too dry climate pineapples are grown and there is Europe's only tea plantation. 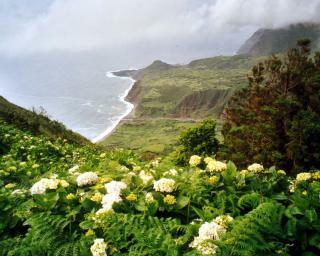 A lookout point with picnic and barbecue area in the northeast of São Miguel. The picturesque valley has a waterfall on one side, on the other side is a small beach. at 31°16' W is the most western part of Europe. The 143 sq km (55 sq miles) small island is quite secluded. Therefore, the electrification for example just started in the late 60's. 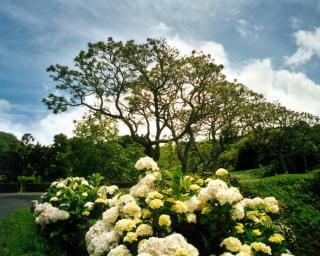 On the other hand the island, as the name suggests, is a paradise of flowers. 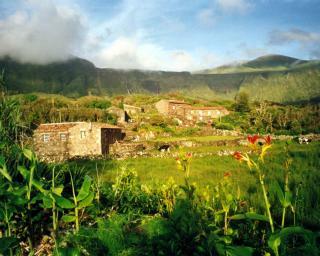 This once abandoned village has been revived recently. The restored and fully equipped cottages can be used now as cosy accommodations. Almost like camping in free nature, but with comfort. The central highland of Flores is shaped by 7 crater lakes. At the coastal cliffs, there are many waterfalls, some of them dropping directly into the sea. With 1500 mm (60 in) of annual rainfall, it is almost twice as damp as it is in the southeast of the archipelago, 600 km (370 miles) from here. 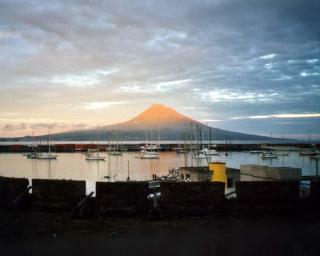 on the island of Faial is a destination for sailing boats crossing the Atlantic Ocean. 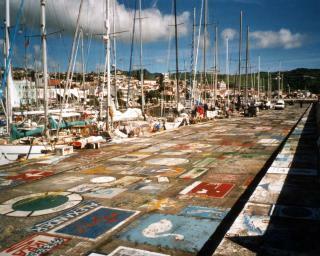 There is a tradition to paint a picture on the pier showing the names of boat and crew and the year(s) of visit. In the west, the island was enlarged by more than 2 sq km (about 1 sq mile), when the submarine volcano of Capelinhos erupted in 1957/58. The vegetation buried at that time by ash now struggles to cover the over 100 m (330 ft) high hills of lava again. From the hotel in the fortress of Horta one has a wonderful view of the highest mountain of Portugal, the 2351 m (7713 ft) high volcano Pico. 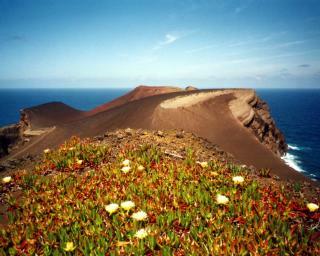 The island of the same name is separated from Faial only by a narrow channel. All pictures can be enlarged to 1280x1024 by clicking on them.